After the recent dismissal by the Hearing Examiner of a challenge to the Final Environmental Impact Statement (EIS), the city could take the next step and issue a redevelopment plan. 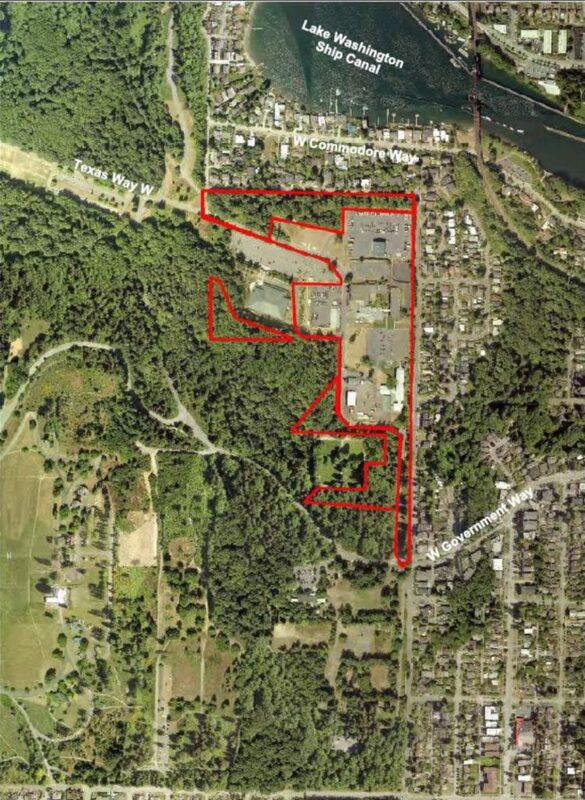 During the contentious EIS process, some Seattle residents and advocacy groups (particularly those in Magnolia) argued that the 34-acre site should be used to expand nearby Discovery Park, while others advocated for increasing the amount of affordable housing beyond the 238 units in the proposal that the EIS studied. 86 units of studio apartments in a complex: 85 units for homeless supportive housing for seniors, including veterans. It will be built through a partnership between Catholic Housing Services and the United Indians of All Tribes, with case management services provided by Catholic Community Services of Western Washington. One unit will be for a site manager. 100 affordable housing rental units for households making up to 60% of AMI, constructed by Catholic Housing Services. The housing development will include a multi-function community meeting space. 52 townhomes/rowhouses, intended for ownership by households earning up to 80% of AMI. Habitat for Humanity will construct the units, which will be rent-restricted for at least 50 years. HfH will continue to own the underlying land and lease it to the unit owners through 99-year leases that are renewable and inheritable. 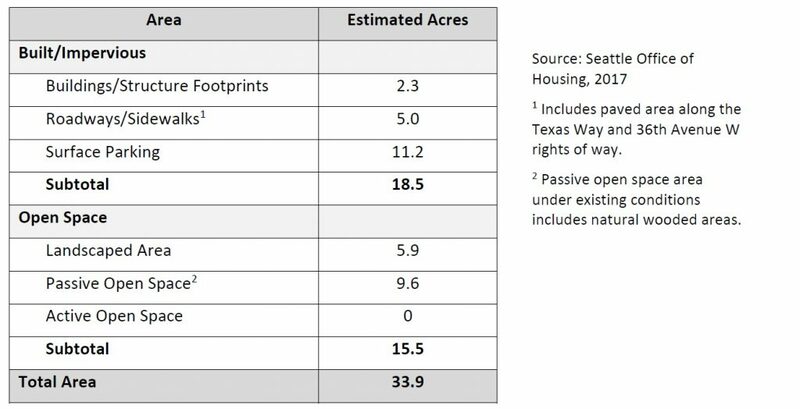 61% of the site will be for open space and recreational use, including 13 acres of “passive” recreation uses such as picnicking and viewing (including a park space among the rowhouses/townhouses), and 5 acres for active recreation activities. 4 to 5 acres of wooded area will be incorporated into Discovery Park. The city intends to create two unlit, multi-purpose fields, and is negotiating with Seattle Public Schools for the school district to manage and use those fields. 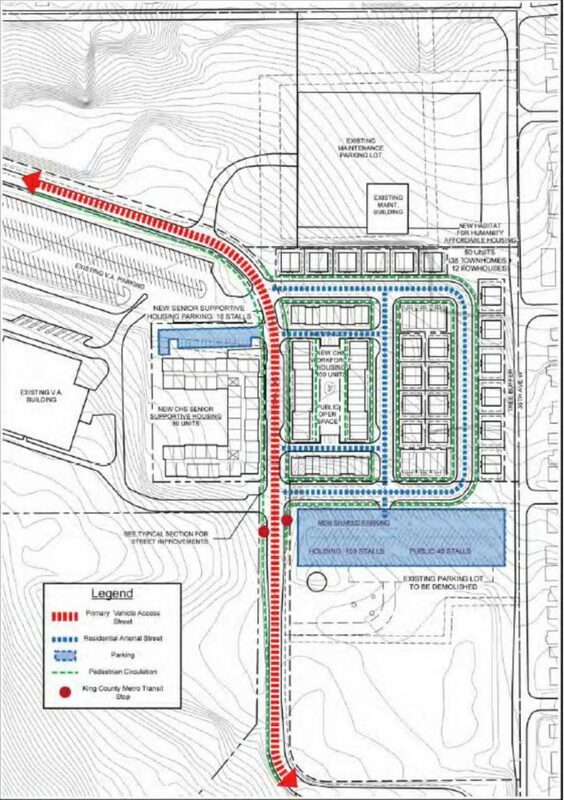 Sidewalks and trails will be installed throughout the site, though without direct connections to Discovery Park or the Magnolia neighborhood. 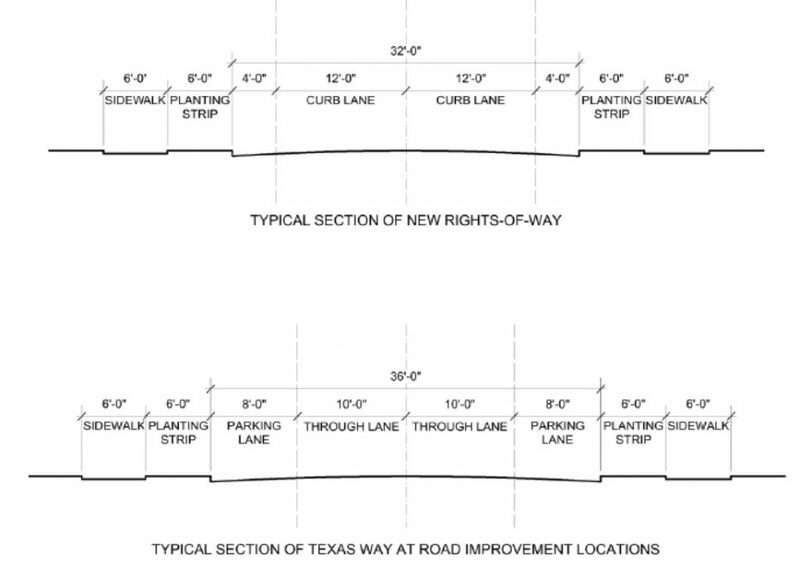 Texas Way, the main street through the site, will also be improved, with 6-foot sidewalks on both sides (though no bike lanes), planting strips, and in some places curb parking . Up to 266 parking spaces will be built: up to 206 withthe housing and 60 for the parks and sports fields. The city expects that up to 226 of the spaces will be in paved lots. For the townhouses/rowhouses, the parking will be on the ground floor with two floors of housing sitting above. One existing building from the old military installation will be retained as a maintenance facility. The funding will come from a number of sources, including the Office of Housing’s various programs, Low-income Housing Tax Credit Equity, the State Housing Trust Fund, HUD Self-help Ownership Opportunity Program, and the Federal Home Loan Bank (detailed budgets for the three housing developments are in the plan document). Currently, 9-10 acres of the site are zoned for single-family housing up to 7200 square feet, and would need to be rezoned for multifamily housing (LR2). According to the city, in the Comprehensive Plan the property is already designated for multi-family housing. 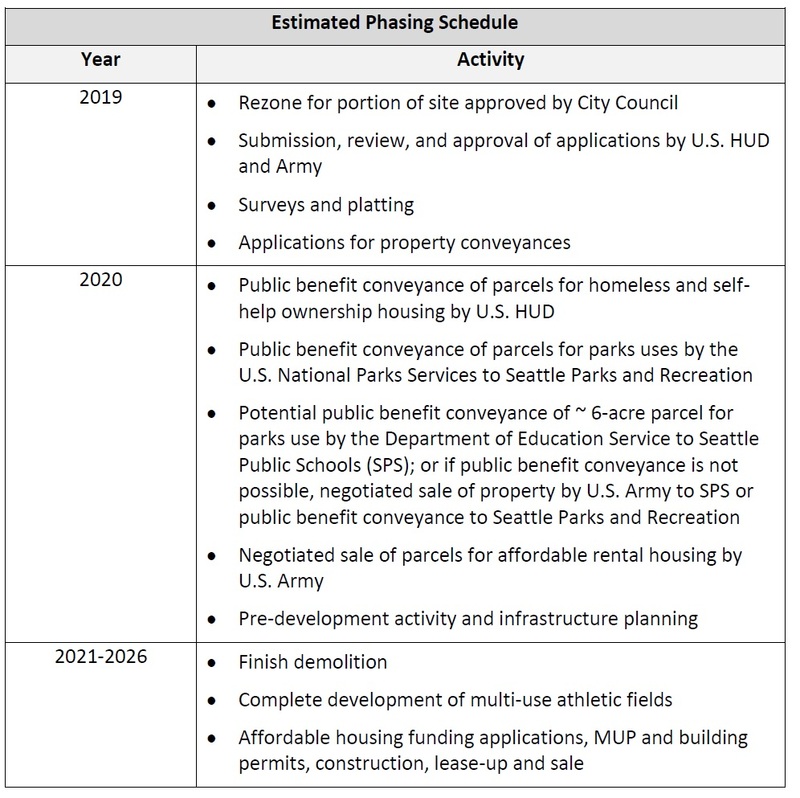 The Office of Housing is now accepting public comment on the Redevelopment Plan; you can submit your comments until February 22 by postal mail, or email to housing@seattle.gov. The department is also holding a public hearing on the plan next Monday, February 11 from 5:30 to 8:30 at the Catherine Blaine School at 2550 34th Ave W. in Magnolia. Once the comments have all been received, the city will consider them, potentially make adjustments to the plan (keeping it within the boundaries of the EIS scope), and submit the final version to the City Council for its approval — likely with its own public review process and tweaking. Sadly, the property conveyance, funding, permitting, demolition and construction are complex and still expected to take years. Why is this site getting so many parking spots? Seems like the City’s direction in all other developments is to to minimize parking spots and the high costs associated with each parking spot. Why can’t the majority of transportation be handle with Metro bus service and not cars? Proposed congestion pricing in downtown will deter people from driving and force people onto buses from this area. This could be a big miss with the plans. I think it’s for a couple of reasons. One, I think this is in a residential area outside a 10-minute walkshed to frequent transit (at least at the moment), which means that there are minimum parking requirements in force under the city’s development standards. Second, there isn’t a lot of street parking as currently planned. It’s still less than 1 spot per unit, but it does seem like a lot — especially when you look at the total acreage. Interesting question. 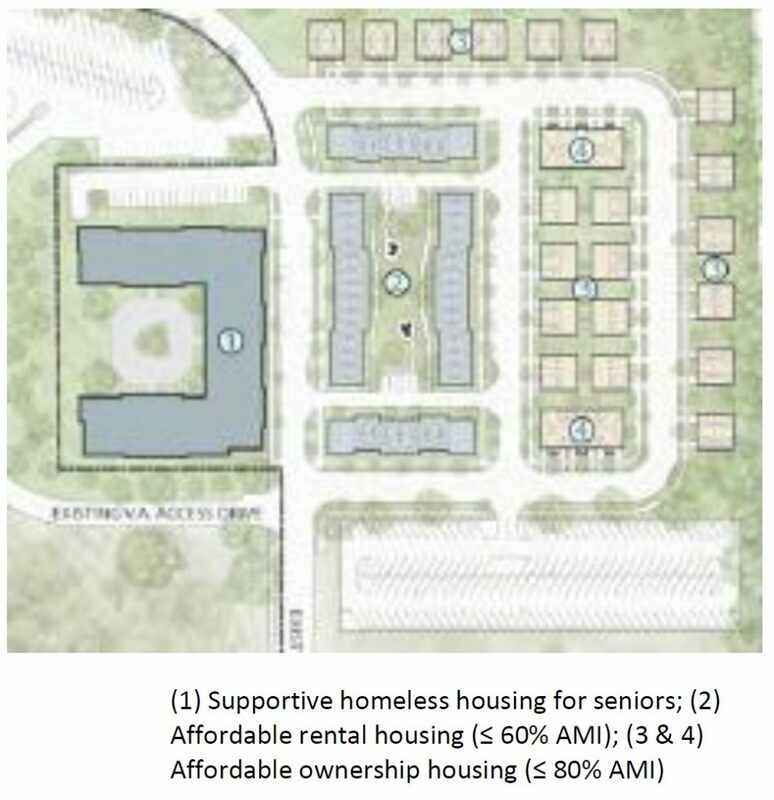 I wouldn’t think there would be a high number of vehicle owners in a formerly homeless or disabled resident over the age of 55 that would qualify for the 30% AMI Maybe the potential residents that might qualify for the 60% AMI might have more than 1 vehicle per unit.